I don’t know about you but right now I’m feeling underwhelmed and overwhelmed at the same time. It’s not really a good feeling. There are so many things to think about – to be worried about – in our world today. And there don’t seem to be a lot of answers or solutions. I work in an organization focused on wildlife preservation and the outdoors and we do lots of great work. At the same time I wonder (doubt?) if it’s enough. Things are changing at a rapid rate and we are still doing destructive things to our environment – our world and even beyond. To be honest it’s way too much for me to think about most of the time and I’m one of the ones who often buries my head in the sand and just tries to forget about it all. That adds to my feeling of uneasiness though and there’s the guilt that comes along with it. But there are so many things to try to tackle and ignoring the issues is so much easier. There’s mental health/addictions, political termoil, nuclear threat, hunger/poverty, technology and its part in the destruction of real social networks, economic uncertainty, lack of connection to nature, food security/mass farming, water shortages, drug resistant disease, increased weather related disasters and more. Recently our city of Sault Ste. Marie was featured in a W5 documentary about the opiod crisis which has grasped many cities around the country. So many people are dealing with addiction issues and the availability of these extremely potent, often fatal, drugs are putting a massive strain on addicts, their families and the underfunded system that is supposed to try to protect people from themselves. The statistics are staggering and the stories about people who live right here in our city, who are dealing with this on a daily basis, made it real for many in our community who didn’t know, or didn’t want to believe that there’s a problem. I think many people’s eyes have been opened. Unfortunately it will likely be just another issue to turn a blind eye to after the initial shock wears off. Even worse, there are many around who think that it’s the addict’s fault – that they don’t change their ways because they don’t want to. Or that addiction isn’t a “disease” because the person made a choice to start doing drugs. This black and white way of looking at things isn’t the addict’s reality though. There are many issues including poverty, mental health issues, social issues etc. that feed into it. Sure it may have been a bad decision to start doing drugs but that doesn’t mean that addiction isn’t a true disease, any more than cancer, diabetes or schizophrenia are real diseases. 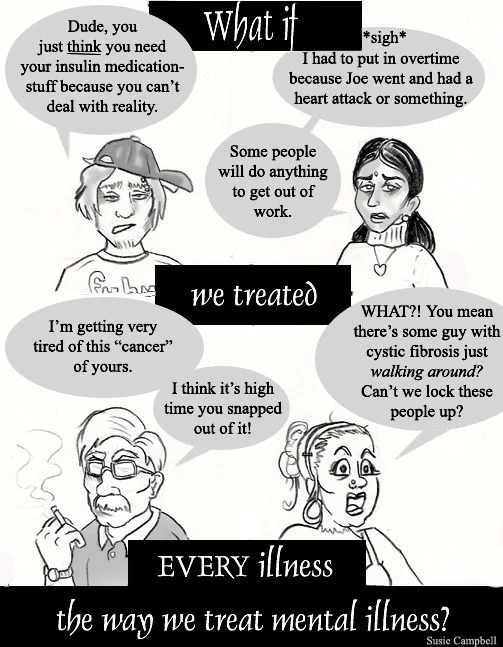 And there’s still this perception that if it’s “in your head” it’s not a disease. I know first hand that people experiencing any sort of mental health issue can have very real symptoms that are just as debilitating as diabetes, a broken leg or even the flu. The reality is that all pain is “in your head” since without the brain you wouldn’t feel pain – whether that pain is being triggered by you leg, your lungs or your mind. It is an extreme over-simplification to only attribute illness to some organs and not others. We all have stories of people who are close to us dealing with difficult things in their lives. Just this week a family member was suicidal and in need of police and medical intervention. Another friend is having to go through yet another round of chemotherapy to try to keep the cancer that is spreading through her body at bay. All difficult and overwhelming situations. But I guess in a few days I might have buried my head in the sand and things may look rosy again. A Stand of Tamarack Trees. Public Domain Image. It’s the time of the year where fall feels like it’s coming to a close and that winter is nipping at our doorway. There have been a few light snowfalls that have quickly melted. Frost is no longer a surprise in the morning. And most of the beautiful fall leaves have fallen. I love fall – the colours, temperature, food, and so much more. The conclusion of fall is often kind of grey and has a dull feeling to it. But it is also the time of year that the tamarack trees start to change colour. Prior to moving up to Northern Ontario I didn’t know a whole lot about tamaracks. But they are kind of a neat tree. Tamaracks are deciduous conifers – which I didn’t even know existed. They have needles and cones but their needles change colour and they shed them in the fall. Their needles are amazingly soft and delicate to the touch in the spring and summer. 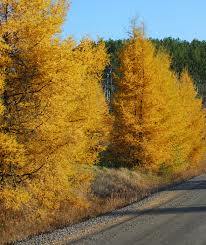 Tamaracks tend to be on the smaller side growing to be around 15 meters tall. They are apparently part of the larch family — which just makes me think of the Monty Python Flying Circus episode that repeatedly features the larch tree. At this time of year the tamaracks have changed to a vibrant yellow and provide appreciated pop of colour amongst the grey landscape. 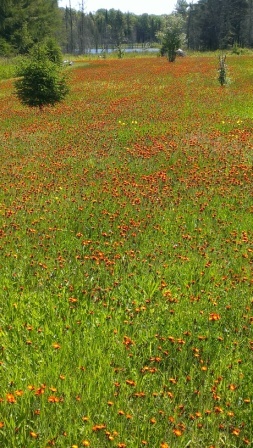 Every year at around this time many of the open spaces at Oslicken Acres become awash in colour. Hieracium aurantiaca more commonly known as orange hawkweeed or devil’s paintbrush come into bloom and green fields become tinged with orange. Part of the daisy family devil’s paintbrush is a perennial plant that is often considered a weed or invasive species. 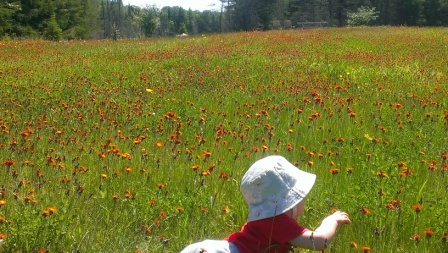 This bountiful flower grows abundantly in Northern Ontario and can often be found in meadows, ditches, and anywhere with lots of sunshine and grass. The name ‘devil’s paintbrush’ was apparently coined by farmers who see it as being troublesome and aggressive in nature. The plant also emits a substance that chokes out other plants from growing too closely – another strike in the invasive species box. Despite this I think the devil’s paintbrush is beautiful. I love the look of the back field before the grass is cut and it is overgrown with the tiny orange flowers. We aren’t trying to grow anything other than grass in that area so the flower isn’t really an intrusion or bother. Andrew has often picked devil’s paintbrush, daises, buttercups and other wild flowers to make small flower arrangements. These arrangements are beautiful even if they are made up of what many people consider weeds. One man’s weed is another man’s bouquet. We live in a world with many issues and problems. This isn’t news to most of us. If you look at things from a high level you’ll see international conflict/war, poverty/hunger, environmental issues, political corruption and numerous other important issues to consider. Environmental problems are vast and include oil spills, invasive species, oceans filling with garbage, nuclear plant failures, carbon emissions, endangered species etc. The list goes on and on, and for most of us it can quickly become overwhelming thinking about these issues and what we might be able to do to help remedy the situation. We know these problems exist and we want to help correct them but often feel helpless to really make a difference. Many of us try to make daily decisions to limit our contributions to the problem somewhat. We recycle what we can to divert garbage from landfill, we don’t litter, and we don’t spray hazardous chemicals on our lawns and gardens. Maybe some of us even grow our own organic vegetables, drive an electric car or have installed solar panels to reduce reliance on outside energy sources. Individually this helps in a small way and we feel better for knowing we’re making an effort to improve the situation. But many of us also have a nagging feeling that what we’re doing isn’t really enough. That as a society we need to do better, but the problems seem so overwhelming that we don’t know where to begin or how to make real difference. And often this is where our thinking/action on the subject ends. The problems seem so big that it often seems we’re helpless to affect any real change. We leave things in the hands of our government and the big corporations who create the products we buy, the power we consume, and the food we eat. Unfortunately our capitalist society and governmental systems reward short term profitability over long term sustainability. Corporations have an obligation to create shareholder value, in many cases at the expense of the environment. Government officials act in a way that is most likely to get them voted back in when the next election rolls around. That means doing what the most powerful lobbyists push for – those with money – and guess what; that’s those big corporations fighting for shareholder profits. So as consumers in a capitalist society what can we do? One of the most powerful methods is to vote with your wallet. Buy the organic vegetables that were grown without the use of pesticides/poison. Avoid purchasing products that have excess packaging or packaging that isn’t recyclable. Stop buying products/services from organizations that you know have poor track records when it comes to the environment or other societal implications. Avoid purchasing products containing hazardous chemicals (cleaners, pesticides etc.). Buy products from those who have the overall health of our world embedded into the mission of everything they do and who support full disclosure product labeling so we know exactly what is in the products/foods we buy and how it affects us and our world. If enough people were to take these steps it would eventually start to affect the profitability of the offending organizations enough to force them to change their ways. Perhaps this seems like a simplification of the problem/solution, and yes there are many complicating factors, but at a basic level we do have the ability to influence things if a critical mass of people were to embrace these types of choices. I warned you this would be a serious post and I don’t profess to be any better than anyone else out there when it comes to our household’s dealing with these issues. But it seems to me we need to do better for the sake of our world.